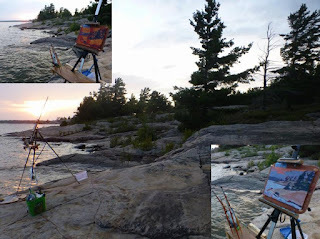 #2002 "Killbear Flagged Pines at Sunset"
After completing #2001 "Killbear Sunset Across the Twin Points", I simply turned the easel clockwise to view the shoreline of Killbear to the northwest. 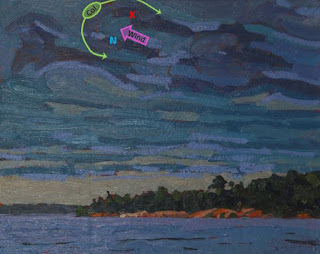 The trees of the Killbear coast were heavily flagged with the onshore winds. The light from the setting sun was stunning. There were several people taking pictures of me painting. 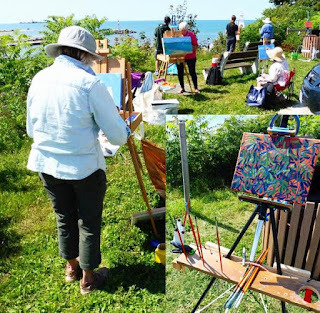 I guess that they do not see plein air painters very often. One person remarked on the weather and said at least it was not raining. These were very true words given that Ontario had essentially remained in a long wave trough position for several years. The best part of the summer of 2017 was still to arrive. It was getting dark and I was all by myself when I finished. I could barely see the panel in the dark. It was time to quit for the day. There was a lot of paint applied to this small and slippery panel. 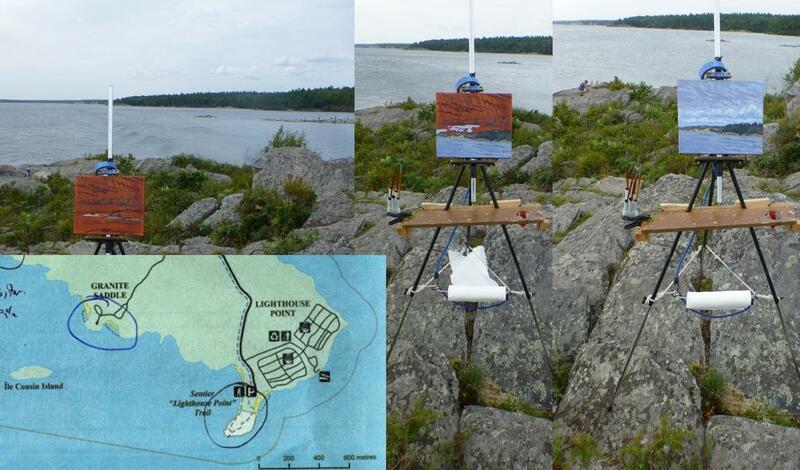 I turned my easel to southwest after completing #1999 "Killbear Sheltered Coves". A couple of islands and an interesting cloudscape finished the day. 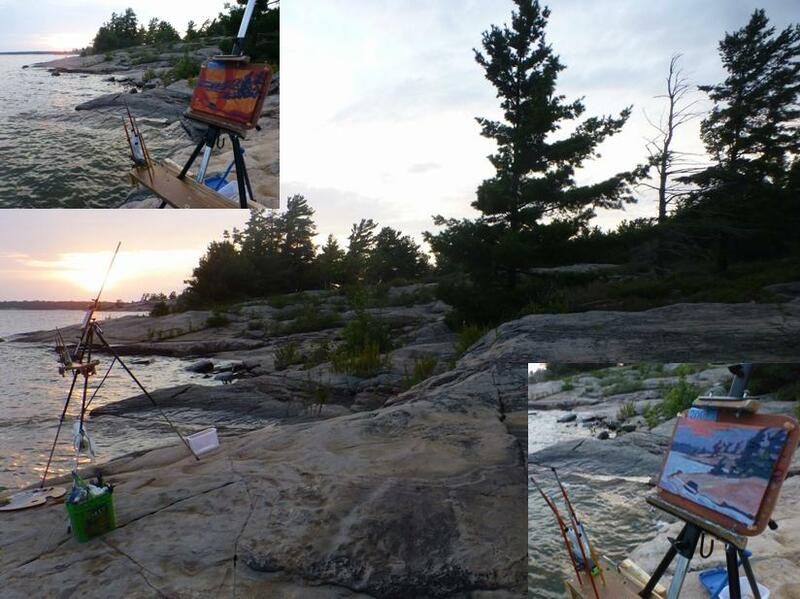 I had to go and set up my camp at the Granite Shores portion of Killbear Provincial Park before it got too dark. The large island is called Longs and is outside to the south of the boundary of Killbear. McLean and Sister Islands lie further to the southwest. That is Rose Island in the background. The islands were backlit and thus quite dark in the shadows. A summer storm was on the way. There were lots of people walking around and taking photographs. One lady wanted to purchase the painting but I need to photograph it and document it first for my memories. After the drive from the Tom Thomson Art Gallery (the TOM) in Owen Sound and the flat tire along Highway 400, I was a just a bit tired. I felt though that there was a need to make the most of the stay at Killbear Provincial Park. 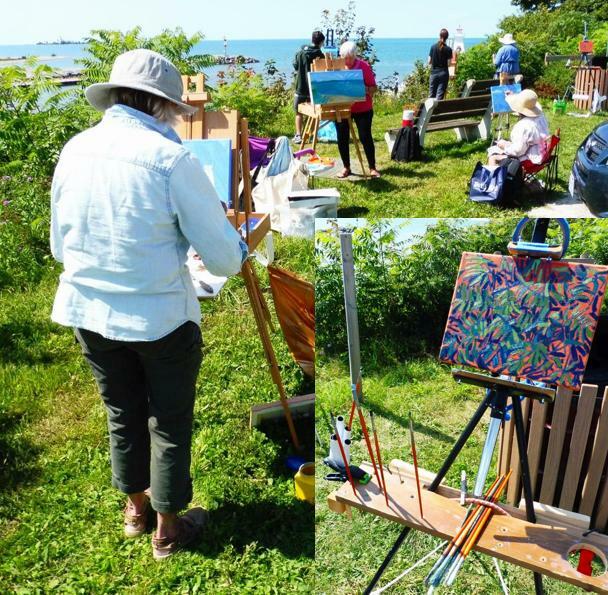 I headed out to the Lighthouse Point to find something to paint. 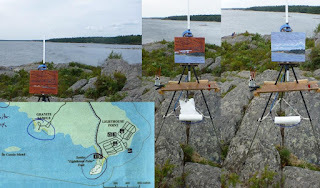 The Sentier Lighthouse Point Trail took me to an automated beacon. The light was no substitute for the Imperial Tower of Chantry so I painted the surrounding landscapes instead. 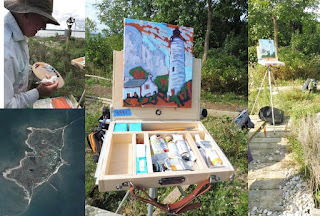 I set up on the rocks and started to paint. There were a lot of visitors. One lady jumped out of her skin after seeing a “huge snake that looked like a cougar”. I suppose that the eastern fox snake was equally terrified. The eastern fox snake is endangered. The populations are doing well on the inaccessible rocky islands offshore in Georgian Bay but apparently these snakes leave their island sanctuaries for the mainland to select breeding sites. They often swim 10 kilometres or more in straight lines in order to mate. Once on the mainland, these long snakes are susceptible to humans. After mating they return to their island homes. The Massasauga rattlesnakes are also having a tough time with 27 snakes being killed on the roads within Killbear in 2005. Reptile fencing and road underpasses were constructed to guide the snakes and so far in 2017, only two snakes have died on the roads. Rattlesnakes need the rocky outcrops but also the marshes where they hunt their prey. This view to the northwest showed the expanse of Killbear Provincial Park. It is really a series of sandy coves on a large granite ridge. It has a very interesting history as summarized by the plagues which I photographed. This is the sixth demonstration piece for the Southampton Art School's Wind Waves and Weather 2017. We had a full and eager list of participants. 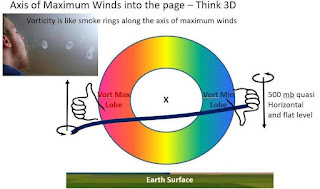 I asked the participants of Wind Waves and Weather what they wanted as a demonstration painting. I do not wish to infringe on their painting time but sometimes relaxing and watching me paint can be helpful. I try to describe what I am doing and why but often it is experience beyond any language. I roll my brush in my fingers and never really think of it. Sometimes I scrape paint on to the heel and sometimes the ferrule of the brush and then simply lay it where it belongs. These are natural reflexes developed over fifty years. I also leave varying amounts of the complementary tint of the canvas to peek through the brush strokes. The Canadian flags were three strokes apiece. I have painted this row of sail boats before so I knew them well. 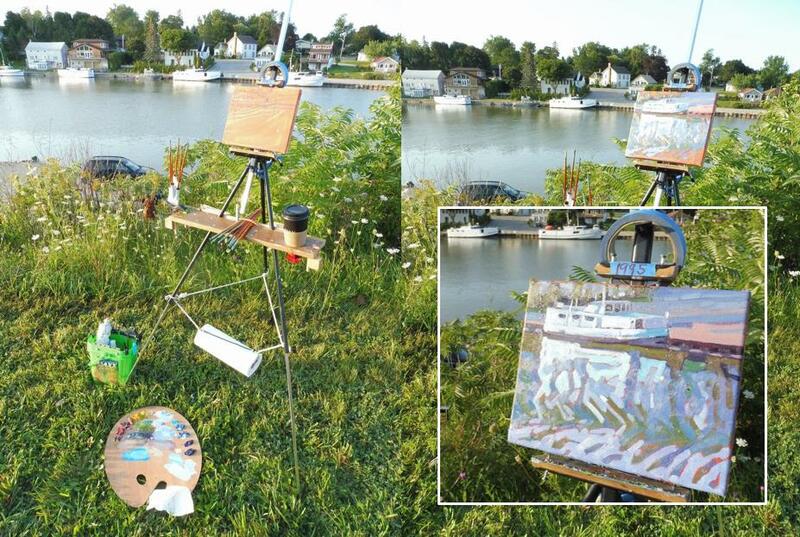 I placed them high on the canvas and concentrated on the reflections and the water. The encouragement I received from the group was gratifying and still makes me smile. 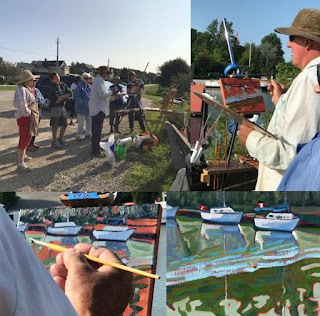 I covered things like how to do the sail boat masts and how to drive the brush where you want it to go... like driving a car... you look where you are going and not the front bumper. I forgot to take in progress pictures of this painting as I was so engrossed in the moment. The participants were so inspiring that I quite forgot. These pictures are courtesy of the participants. #1995 "Benjamin-Charles the Turtle Boat"
This is the fifth demonstration piece for the Southampton Art School's Wind Waves and Weather 2017. We had a full and eager list of participants. 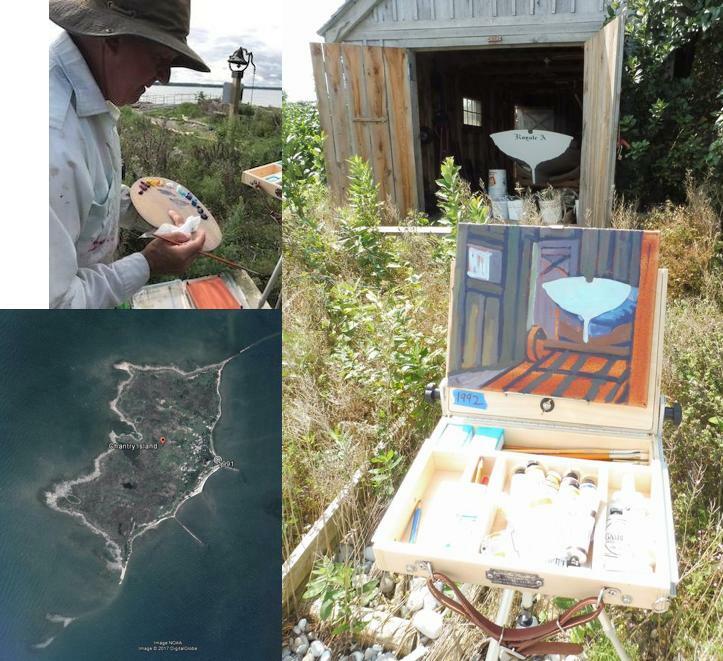 A day at Scubby's Bluff allows one to paint anything and everything from boats to trees to islands. I arrived early around 7:15 am at Scubby’s Bluff on the last day of Wind Waves and Weather. 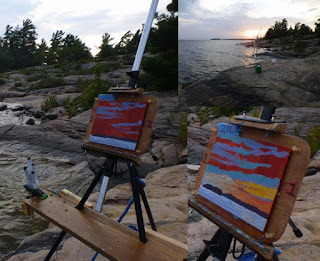 I wanted to get a painting completed before anyone arrived in order to demonstrate the many possibilities of the sunrise light. The Benjamin-Charles was parked where the tugboat “Pride” used to reside. 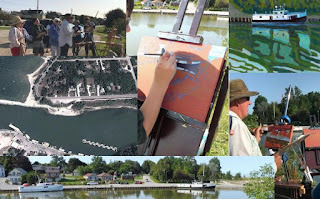 The fishing boat in the turtle craft style was still interesting enough to paint. The morning light was perfect and the temperature was just right. It was a Goldilocks morning to paint. A young chap drove in and appreciated my efforts. He ascertained that his favourite fishing rock was already occupied. He was a fun fisherman and very knowledgeable. Apparently the walleye where back and running up the Saugeen after being absent for too long. He had caught a 22 pound salmon the previous week . He knew his craft and appreciated mine. I liked him a lot. He was a conservationist at heart but loved to fish – nothing wrong with that. Art is about making memories and the story of the young fisherman became part of that creation. There is still some confusion over the name of this style of fishing boat.. I have even heard it called a beaver boat. 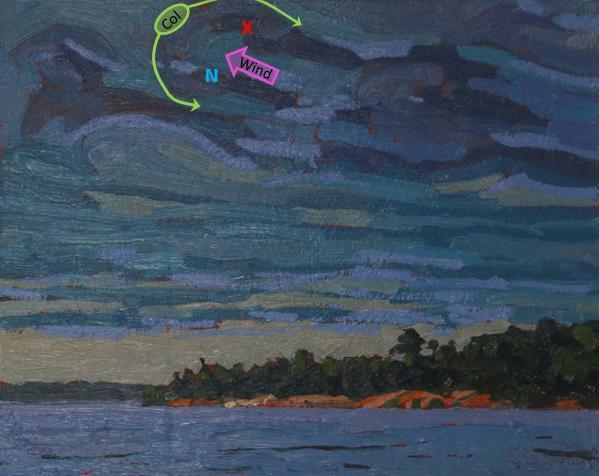 #1994 "Lake Breeze Cumulus over Southampton Beach"
This is the fourth demonstration piece for the Southampton Art School's Wind Waves and Weather 2017. We had a full and eager list of participants. A day at the beach is always full of inspiration. The participants were struggling with clouds. Generally they were trying to be too perfect and precise with a subject that changed in colour, tone and shape by the minute. I wanted to teach them to unwind, relax and not worry about the exactness of any interpretation of the moving target. Typically a similar cloud is waiting in the wings should your immediate subject exit the stage. These cumulus clouds were over the southern portions of Southampton Beach and still moving inland when I observed them. I blocked them in and painted quickly. 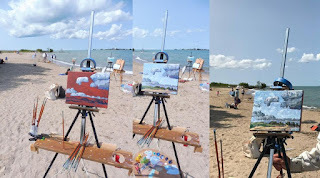 Art is all about making memories and even though these clouds are long gone, the experience still lives on in the painting. #1992 "Life Saving Ready on Chantry Island"
This is the second demonstration piece for the Southampton Art School's Wind Waves and Weather 2017. We had a full and eager list of participants. It was time to end the morning painting session as the light had climbed overhead and was starting into the afternoon sky. I suggested that I do another demo while they ate their lunch. This is the view into the Chantry Boat House and the back end of the life saving boat. This boat would only see service in the nastiest of conditions when life and limb were in peril. It was named the “Royale A” and I am not sure yet just why. In its day though, this boat would have to be ready to roll on a moment’s notice. In fact the rack supporting the boat was mounted on to railway wheels. Gravity would do the work with just a little shove. The light keepers of Chantry Island saved many lives. 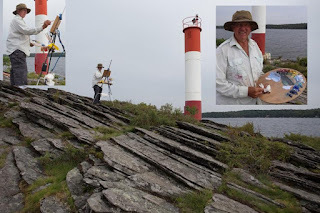 A lighthouse keeper is the person responsible for tending and caring for a lighthouse, particularly the light and lens in the days when oil lamps and clockwork mechanisms were used. Lighthouse keepers were sometimes referred to as "wickies" because of their job trimming the wicks. Chantry Island is a glacial moraine and consists of stone above the water and beneath extending a mile north and a mile south of the island. These underwater shoals of massive granite boulders have made this area one of the most treacherous in the Great Lakes. There are over 50 known shipwrecks around the island and there are many accounts from the 1800’s and early – mid 1900’s of these disasters and lost lives. #1991 "Imperial Towers on Chantry"
This is the first demonstration piece for the Southampton Art School's Wind Waves and Weather 2017. We had a full and eager list of participants. The towering cumulus clouds were a happy and accidental juxtaposition with the Imperial Tower in the composition. The altocumulus cloud foretold of some weather on the way. This is the view into the Chantry Light Keepers House and the Imperial Tower. Chantry Island is located on Lake Huron, just over a mile southwest of the Saugeen River mouth in Southampton, Ontario. On the island is a majestic Imperial Lighthouse built in the mid 1800’s, as well as the Keeper’s quarters and a boat house. In 1822, during a hydrographic survey, Captain Henry Bayfield of the Royal Navy christened the island and named it after his friend and British sculptor Sir Francis Chantry. #1972 "Entrance to Grande Chute"
Some of the CPAWS artists returned back to the bridge that crossed Grande Chute. Vic, Angela and Lynne were my painting partners. I stood in the middle of the bridge looking up the inflow of the west channel that fed Grand Chute. This time I wanted to include the black spruce and trees on the island. The palette flipped onto the sand and gravel of the Grande Chute Bridge. 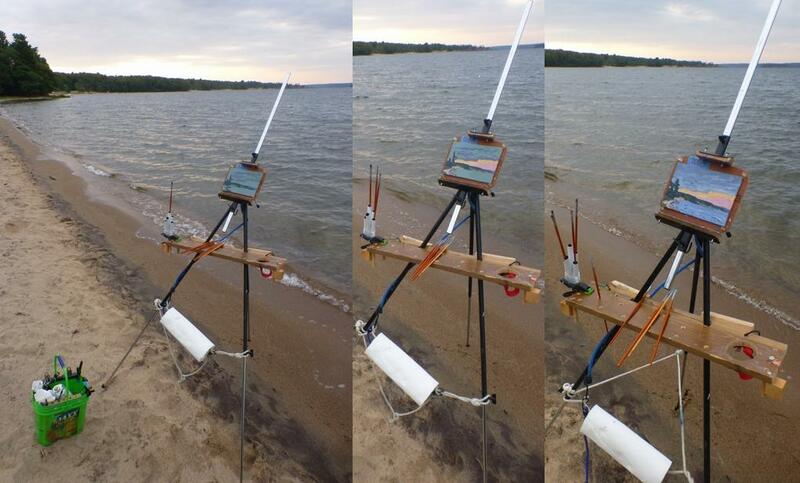 Like all things that are sticky on one side, the painted side of the palette landed face down into the sand. The added texture that followed in the remaining paintings was authentic Grande Chute sand. The sand texture added something very earthy to the paintings and was not something you would be likely to find in any studio produced art. Saturday was the 140th Anniversary of Tom Thomson's birth in 1877 in Claremont, Pickering Township about 50 km east of Toronto on Lake Ontario. Tom was the sixth of ten children. Tom was only two months old when the family moved to a farm in Leith, eleven km northeast of Owen Sound. Tom died much too early just shy of his 40th birthday on July 8, 1917. 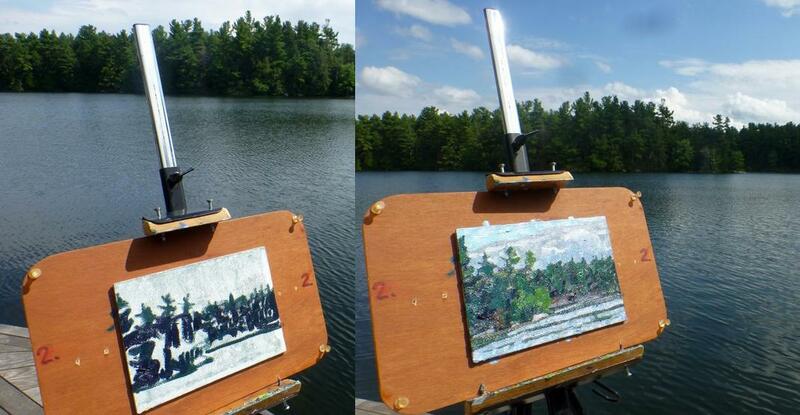 I hope that Tom would have been pleased with my plein air efforts on this special day. #1989 "Bass Lake Cottage Shore"
The Plein Air Painters Thousand Islands Region (PAPTIR) started and organized by Robert Hedden were having their August paint out close to Singleton Lake. Although I was just back from the Dumoine Art Camp, I felt I still needed to paint some more. From the map and Google Earth, one can see that the eastern shore of the west basin of Bass Lake is heavily populated by cottages and boats. This is what I wanted to capture on this small and rough panel. There was little chance of including too much detail in the final painting on the coarse surface even if I had been wearing my glasses.